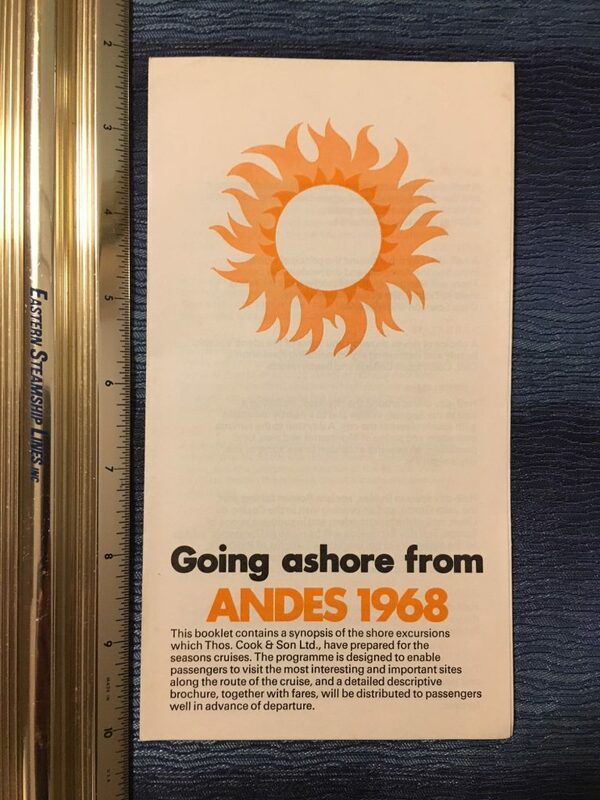 Great little booklet for the obscure little freighter/liner. 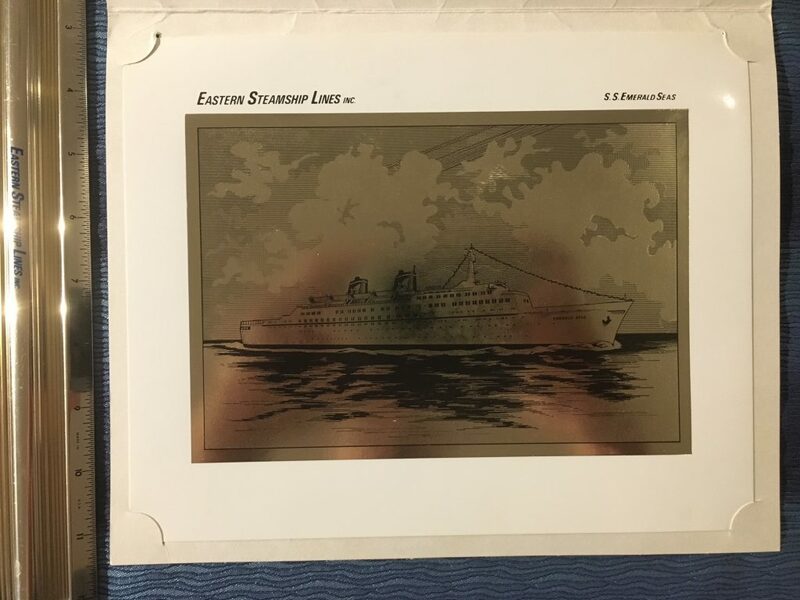 Includes plans and some interior photos. 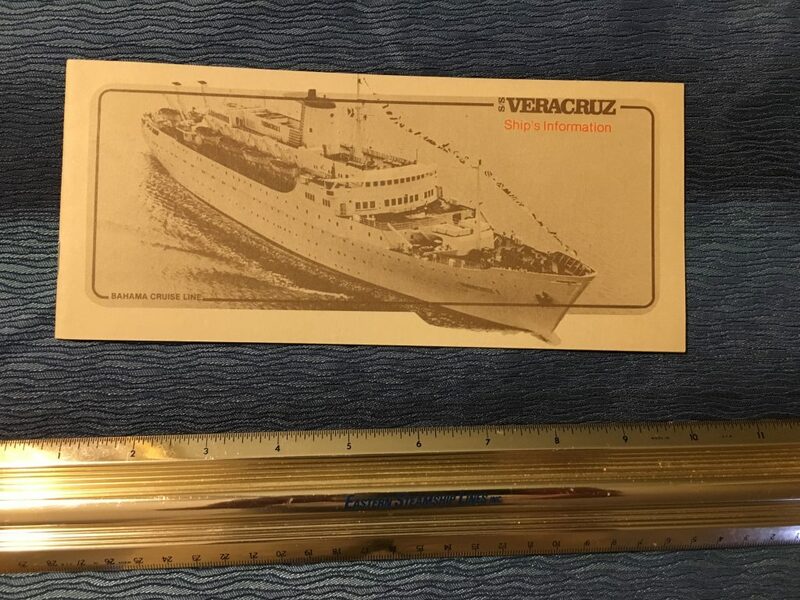 Great on board booklet describing all the services and amenities for the 2 sister ships Cabo San Roque and Cabo San Vicente. great graphics and lots of information .. all in Portuguese … how romantic! 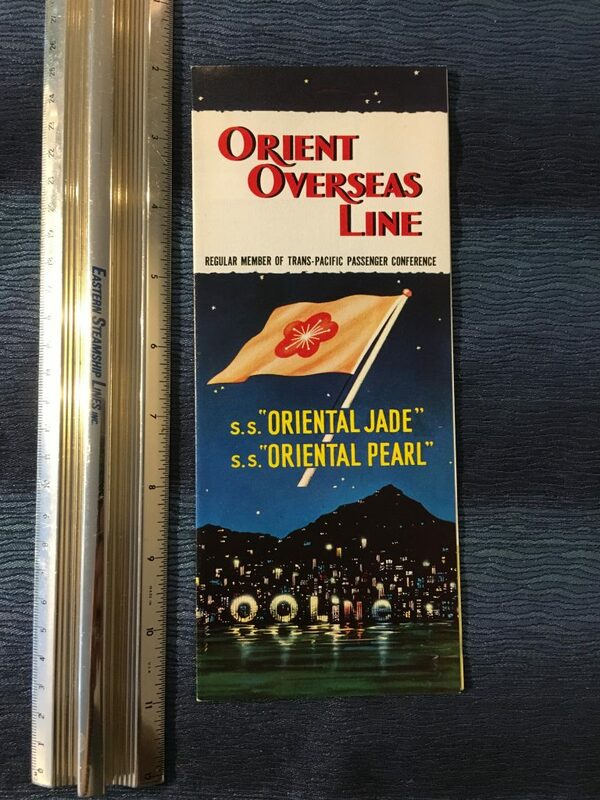 This stock covers and in excellent condition. 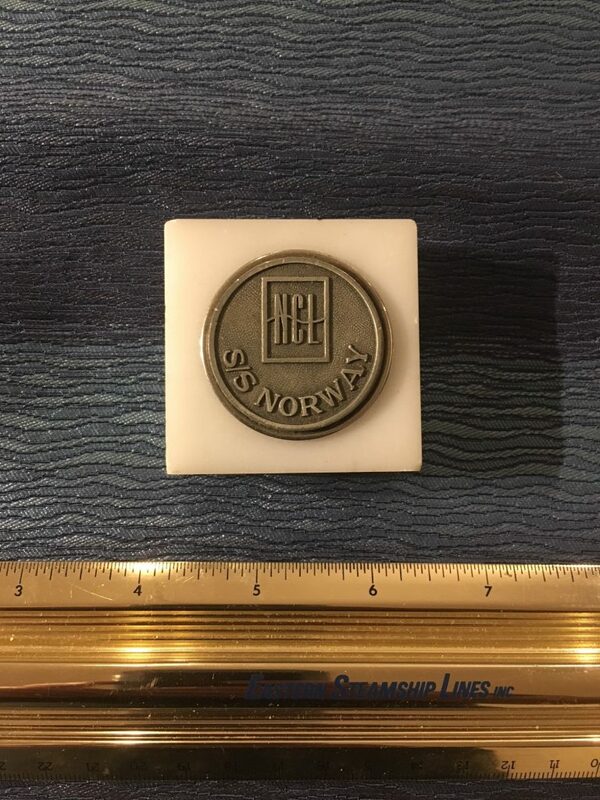 Nice little paper weight that would have been onboard in the ships gift shop. 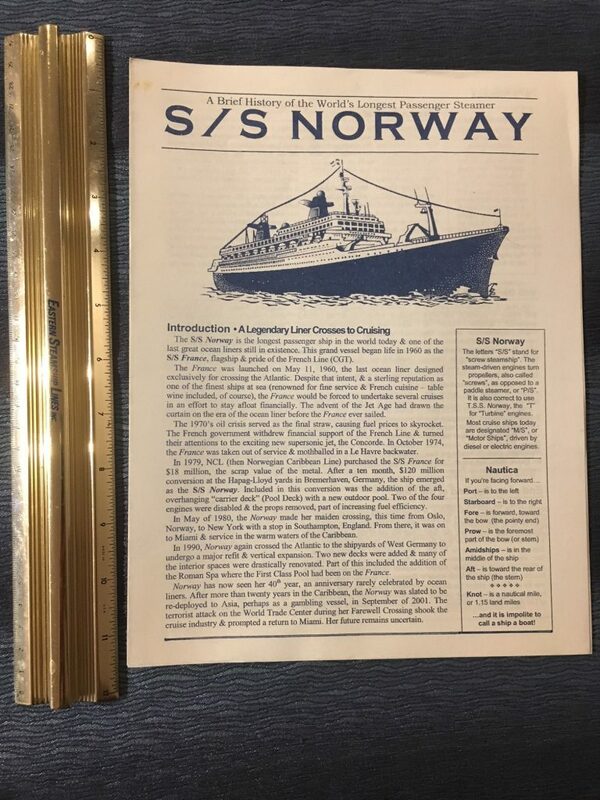 This History folder would have been in your welcome packet when you came onboard and was loaded with all sorts of Information about the France and her later conversion to the Norway. 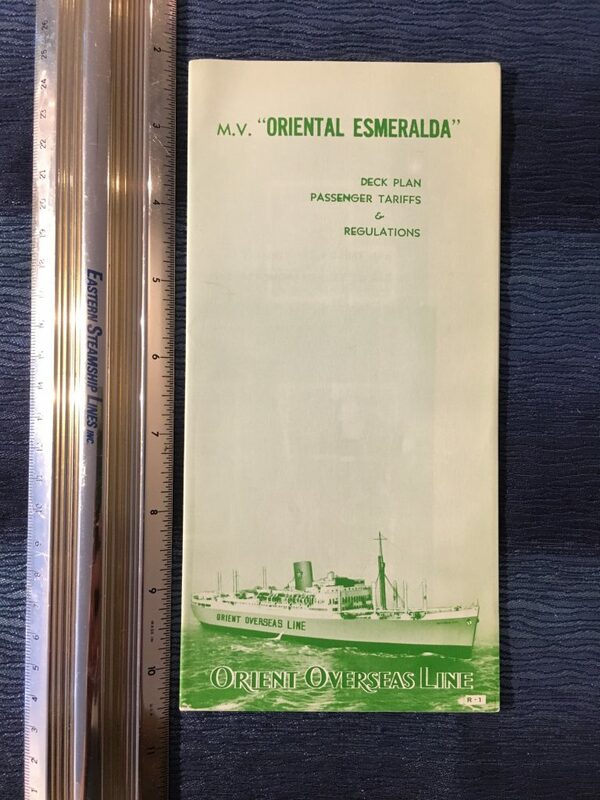 Packed with all sorts of fact and figures from the ships long life. 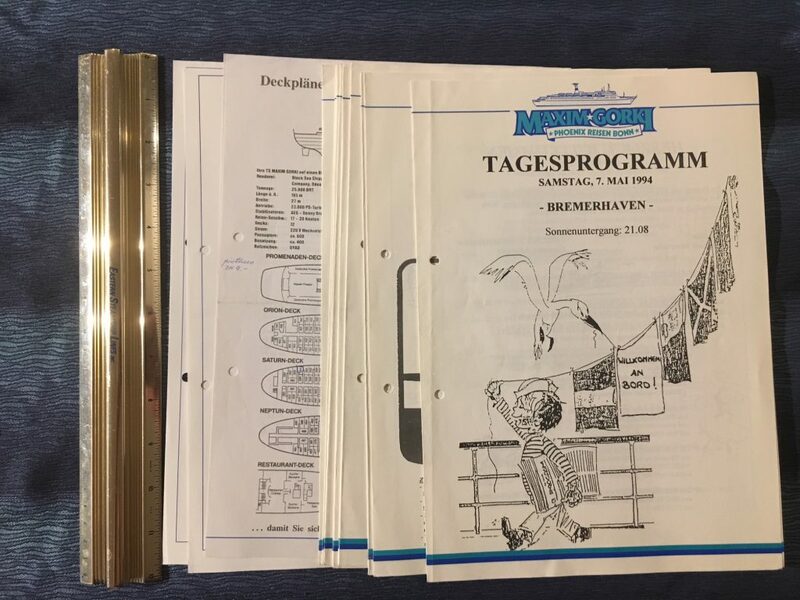 These German Language programs are Dated May 7th-May 18th (May 9th missing) and detail the daily activities on the ship. 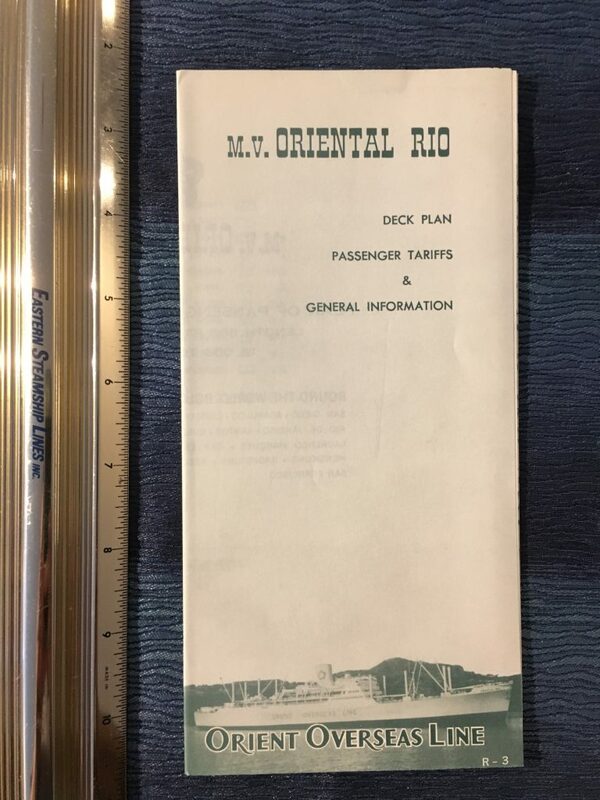 Also included are some Mimeo deck plans and Menus. 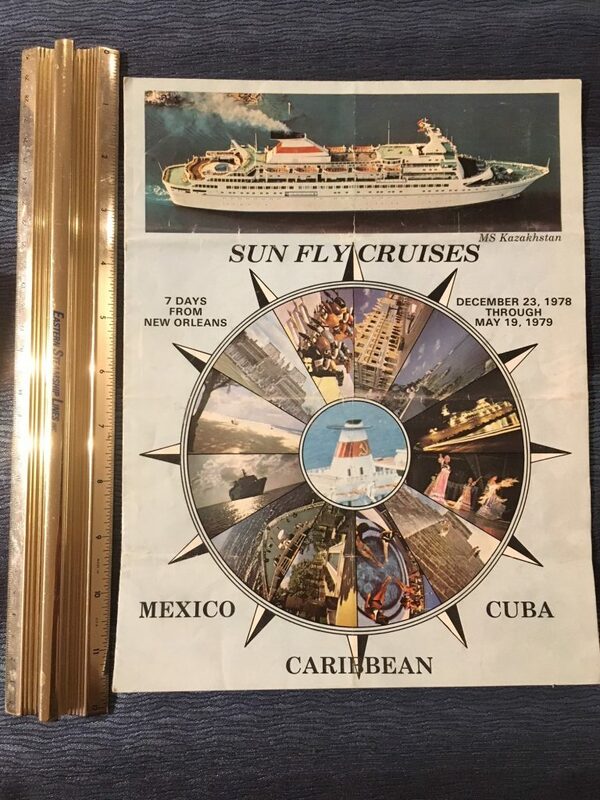 Great plans for the little Zim Liner… there are printed on heavy stock and would be excellent framed. 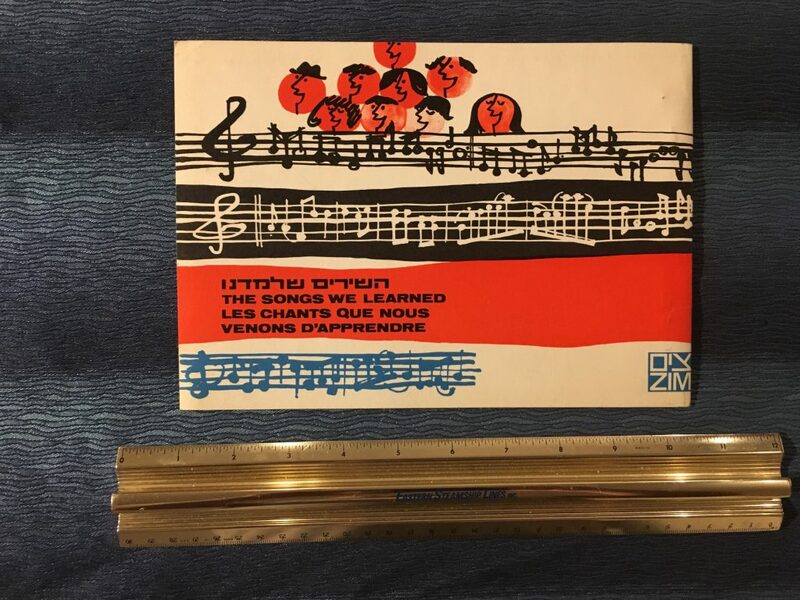 Text in English and Hebrew. 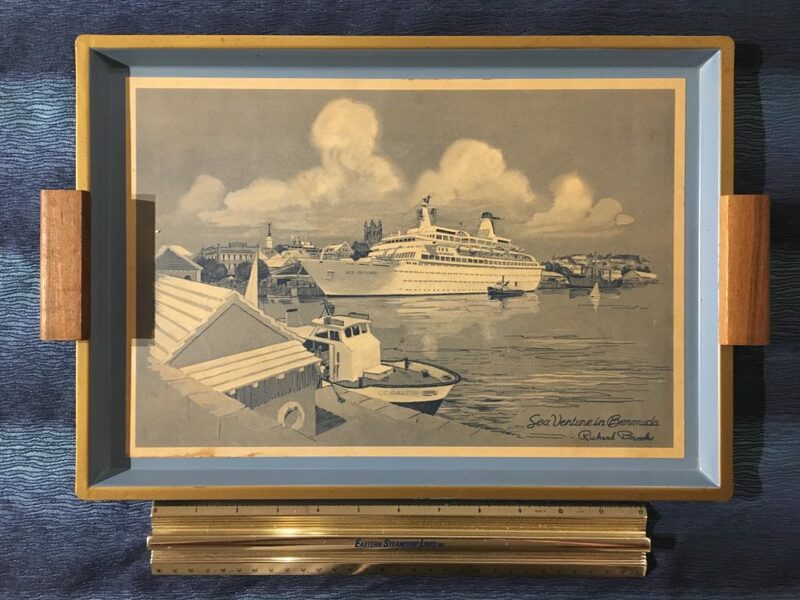 Super serving tray with a lovely port profile of the Sea Venture in Bermuda. The handles are made of teak and the tray itself is sturdy metal construction. 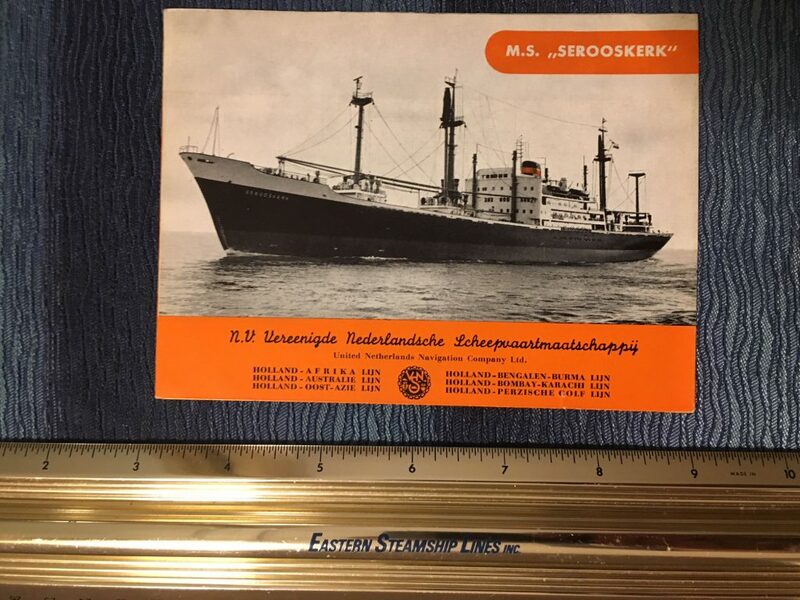 The ship and her sister went to the Princess fleet and became TV Legends. 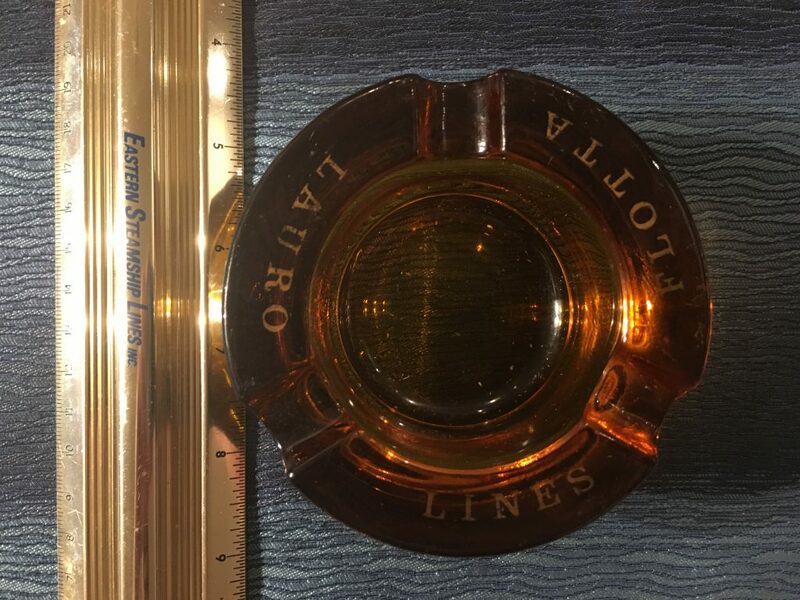 Super heavy ashtray in excellent shape … the gold lettering on the rim surface has a few scratches. 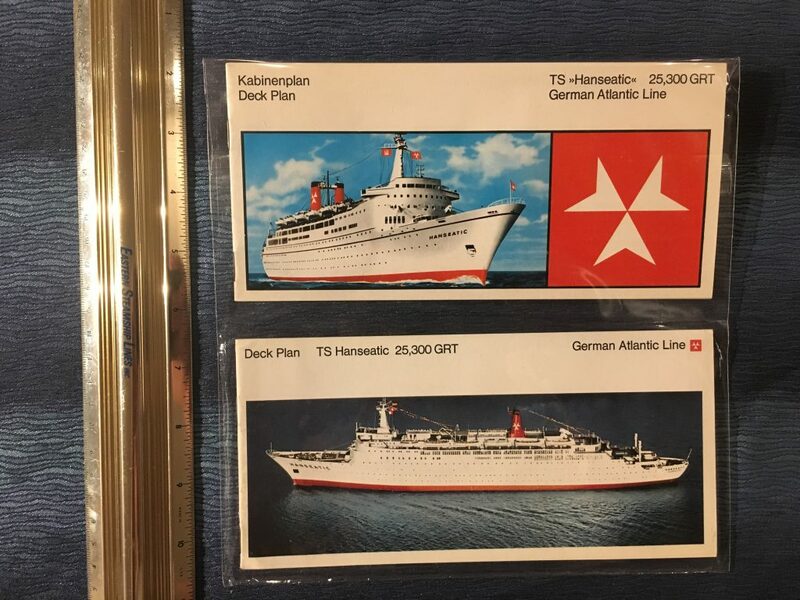 2 great deck plans for Hanseatic 2 (Zim Lines ex Shalom and Later Home Lines Doric) one of them is in German and one of them is in English. 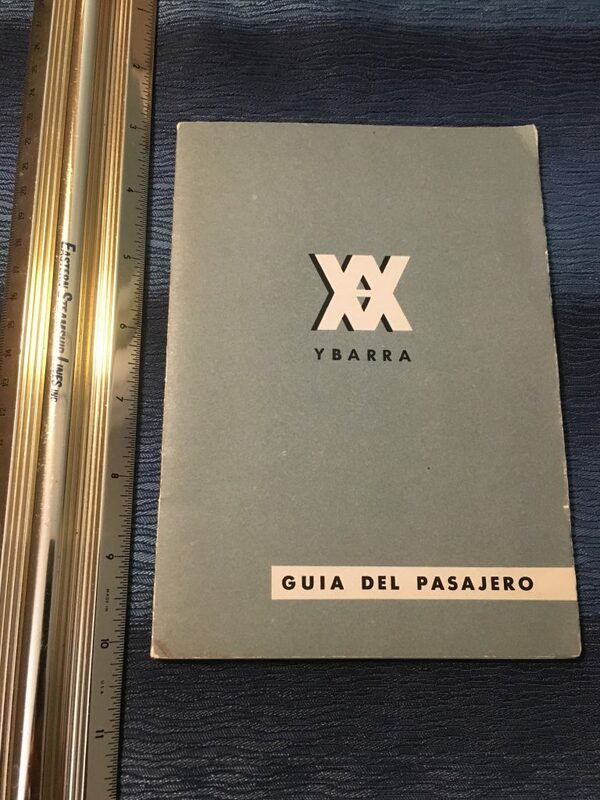 Both are in excellent condition and have Van Nuys California agency stamps. 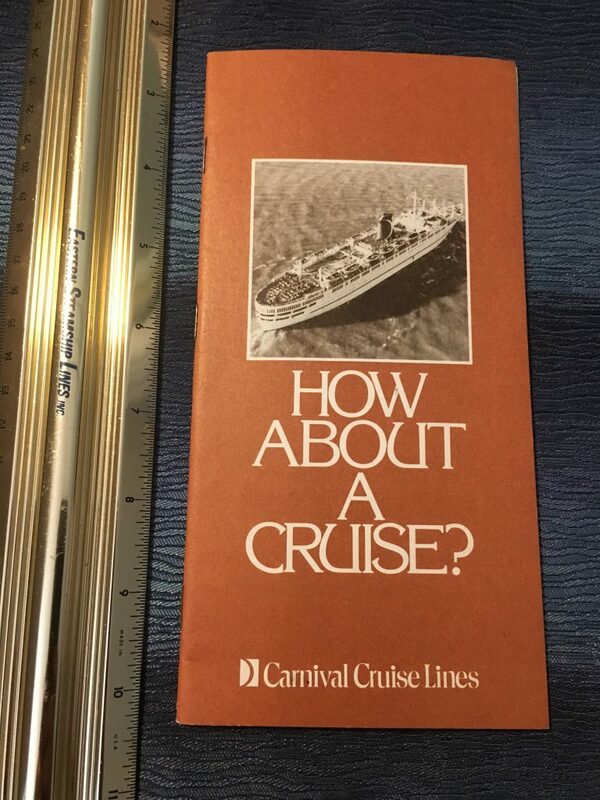 Unusual item from a long-ago cruise … a lovely songbook. In traditional Jewish form this opens from back to front and is read right to left. In excellent shape with FAB graphics! 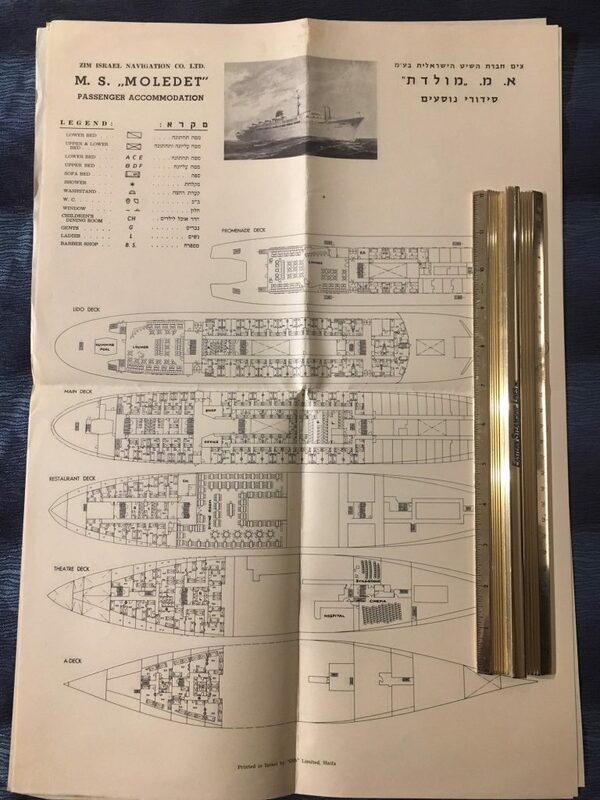 Excellent deck plans for the little Rio for her ATW route .. includes plans for A,B,C and D deck. Excellent deck plans and interior pictures in foldout format. These are printed on lovely textured stock and are in excellent condition. The ships Interiors still have their 4 Aces-American Export feel … though they have been updated for the OOL service. 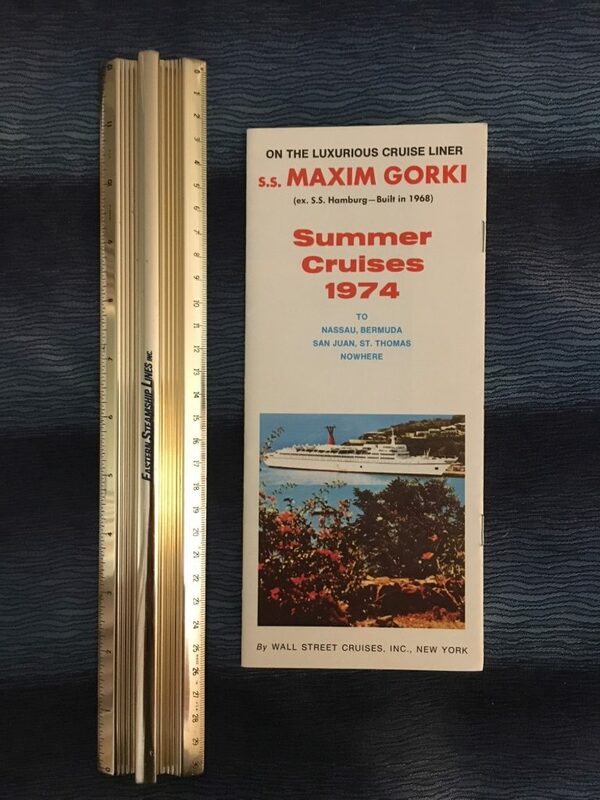 Covering all cruises and voyages from various lines in the 1977 seasons. 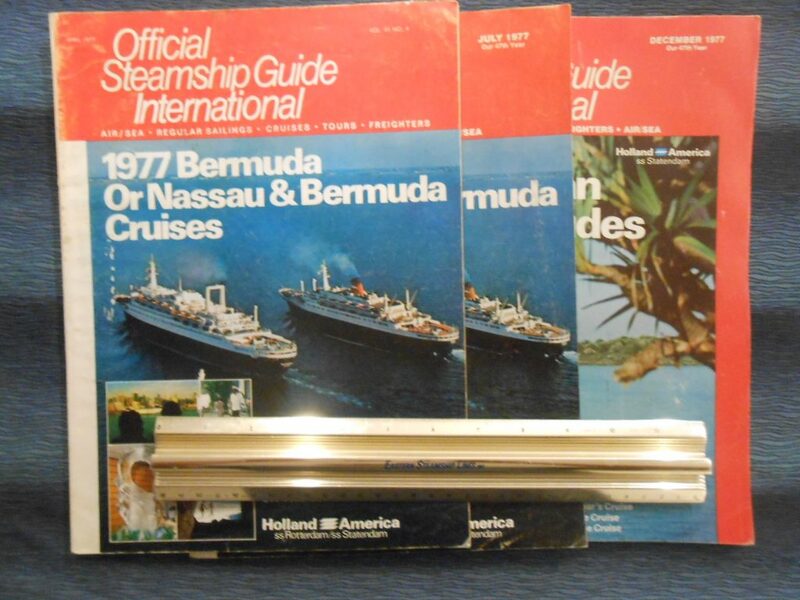 These are dated April, July and December 1977. Good condition. 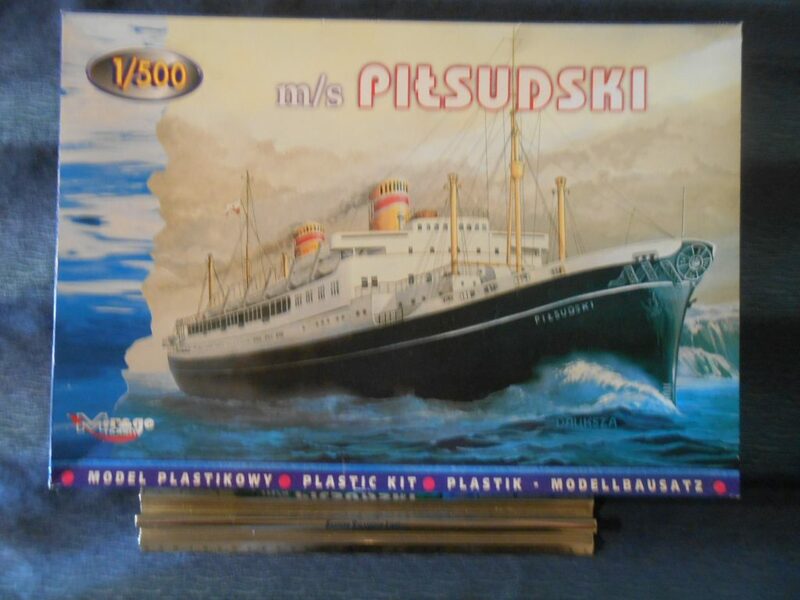 Beautiful 1/1500 scale model for the lovely Pilsudski. 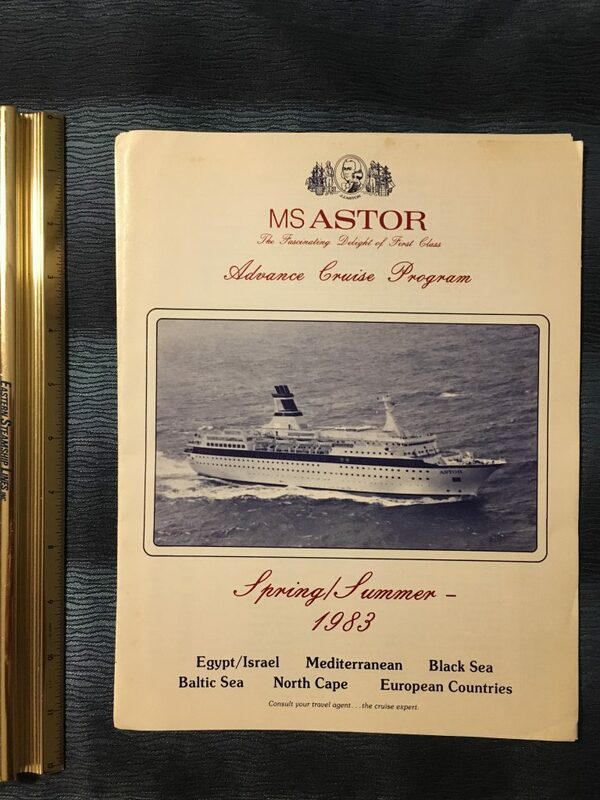 She did not survive WW2 … but her sister Batory did and sailed into the 1960’s. Brand New. I thought this was quite unique … a simple little fold of for NYK that is completely written in Japanese. 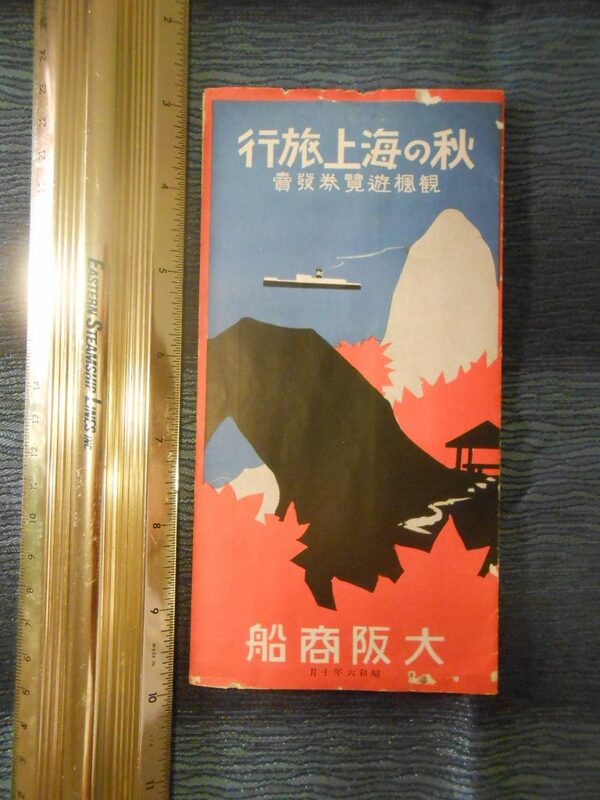 I wish I could read it .. the cover art is outstanding and there is one picture of an NYK vessel on the inside. There are a few little edge nibbles.